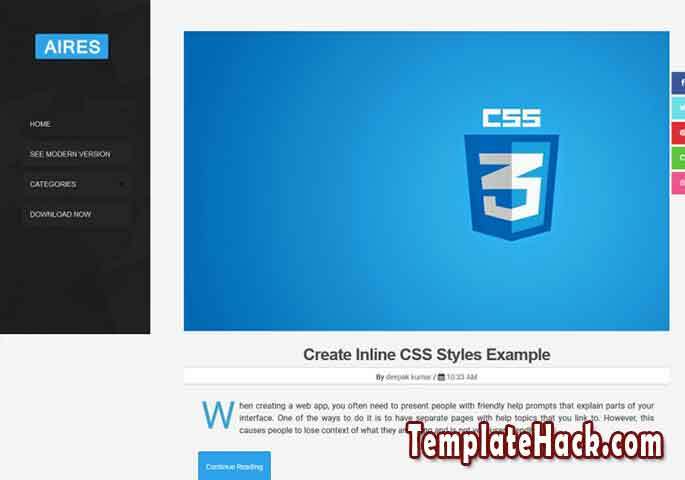 TemplateHack.com - Download Aires Tech premium blogger template. Aires Tech is premium blogger template I’ve share for free just for you. It is responsive blogger template with search engine optimization, simple design and will make your blog look more proffessional. This blogger com templates will look perfect if you install on your magazine blog, technology log, niche blog, news blog, listicle blog, and many more. This template is useable for many niche blogger topics. With responsive design, simple color, one left sidebar, page navigation, dropdown menu, read more button, no widget. If you use Aires Tech blogger tempalte on your website, your website will be powerfull to compete on Google search engine.